Name: Unofficial name is Baby Donkeys. Description: These ponies are about the size of baby G1 MLPs. Now, it's worth mentioning that these come in slightly varying sizes. I have one (besides the one pictured above) that is white with green spots and green hair. This one is slightly larger than the one pictured above. The plastic is thicker with the white/green one as well. They have NO dates or brand markings. These seem to not be MLP mold copies at all. They have skinnier legs than G1 babies, but large heads that are reminiscent of G2s. They have molded hooves, some are painted while others are not. I have seen these in various colors. My white/green Baby Donkey has much larger ears than the blue one pictured above. I beleive these are not made by the same company. I am guessing that the green one is older. Her eyes are larger and her plastic/vinyl seems to be more squishable. The white/green has a single-rooted tail, while the blue has a tail that is rooted in many plugs. Where to buy: Uncertain. Can be found on eBay, thrift stores, etc. 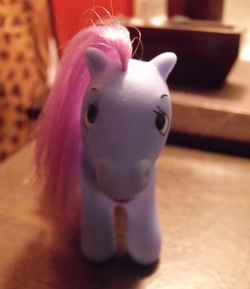 For the sake of similarity, I will include the 2-Pack Dollar General ponies with the Baby Donkies. They have painted hearts on their chest that are a part of what looks to be a necklace (all molded on, of course). They have molded hooves, and bother their manes and tails are rooted. No two seem to have eyes going the same direction. Manufacturer(s): Unmarked, so as for now unknown.